Turn heads with the flick of a wrist. Discover sapphire crystal-set enamel dials and quartz movements from Boss Orange. This distinctive black ion plated stainless steel bracelet and casing watch comes with a deep black dial with sub dials to display the day and date to give perfect functionality for everyday. 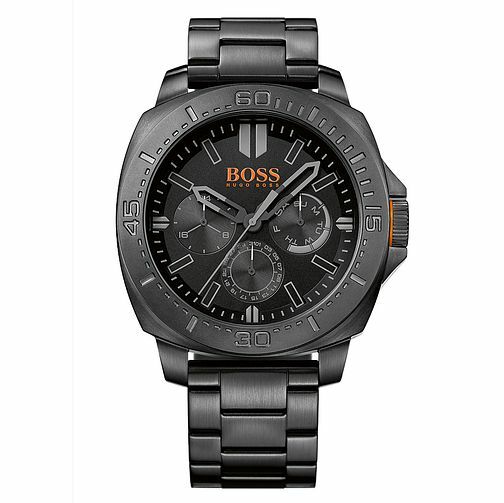 Boss Orange Men's Black Stainless Steel Bracelet Watch is rated 4.5 out of 5 by 6. Rated 5 out of 5 by Anonymous from Looks great I bought this watch as a gift, my partner loves it and it looks great on. Rated 3 out of 5 by Anonymous from Great looking watch but date dials difficult to read Lovely looking watch which appeals to fashion concious ones of all ages. Only negative is the centre dials showing date, date and 24 hour clock is difficult to read in bad light.